The Ambivalence of Content | omg-squee! A couple of months ago while browsing Netflix with my son, we stumbled on the Dreamworks reboot of Voltron. 6-year-old me was a fan of the original in the 80’s. I remembered little of why, just that I was and desperately wanted a lion figurine (but never got one). With my son’s interest in Transformers (sigh), I figured Voltron might be a great way to diversify his interests in robots that became other robots. So we started watching Voltron: Legendary Defender. My partner is going to wet himself when he sees this. Because Voltron: Legendary Defender (VLD) didn’t seem to be a cartoon solely created to sell space lion figurines to kids rich and lucky enough to get them. It was a fully-fledged sci-fi/anime with an expansive, very real universe in peril with a depth of character the adult me yearned for. It was funny and sad and exciting. I would watch an episode or two with my son by day, and an episode (or six) a night with my partner. My partner watched it in his lunch breaks at work. The whole family got something out of it. And we were Hooked. Seven (of eight) seasons were already on Netflix, so we were able to binge for a while. The quality of the writing, I’ll admit, occasionally ebbed, as happens in a show where there are multiple writers. The characters took turns that seemed a little unexpected, given what had come in previous seasons. But overall, I was happy watching this incredible story unfold and allowed myself to be surprised by where it was taken. And then the wait for the final season began. I had just spent perhaps six seasons in agony, terrified that my favourite character (Shiro, for anyone playing at home) would be killed, because just give that guy a break already! I needed to know what happened, but what was going to happen wasn’t out in the world yet. To fill the void that having no new VLD left in me, I did what I’ve always done; I ventured online to find a fandom to discuss it with, which would tide me over. Spoilers for all 8 seasons ahead, and some swearing. Yes there were the beautiful, lovingly-created fanarts/fics and a portion who spread nothing but love. But…the VLD fandom was largely a community at war. anything post season 2 is despised and if you don’t despise it you don’t really understand it. Something was wrong; something I had caught a hint of when watching, but not really focussed on until now. At first I backed away, because who needs a rabid fandom in their lives? But what I had seen did get my brain ticking; not only over show-related topics, but on why and how this apparent loathing had sparked. How could these people claim to be fans of VLD and spew such hatred for it? Shouldn’t they simply stop watching? And then I realised how unfair this was. Logical and intelligent people – extremely articulate and passionate – would not turn on something they loved without due cause. Why do fans inevitably turn on the original content they loved? Because I wasn’t so close to VLD, I began trying to dig into the issue of why – and I was surprised at how difficult it was to locate reputable sources in the quagmire of arguing voices. I’m probably wrong, but it seemed the VLD fans turned when the lead writer and story editor, the universally loved Tim Hedrick (Legend of Korra) departed VLD to work on something else. Hedrick was somebody who truly loved and understood Voltron, from what I’ve read. He still writes the follow-up comics, and prior to coming up with the initial story arc (Shiro being captured by the Galra), actually watched the original series, because he remembered being a fan when he was a child. He further believes that the humor of Legendary Defender serves to make things more dramatic and realistic instead of undercutting drama. Okay, so yes. I supposed the change I’d noticed in the characters and plot arcs made sense; they’d lost the editor who’d tied all the episodes together. How frustrating. According to the fandom, and several unverified sources who claimed to work on the show, Hedrick’s departure was ALL to do with the VLD anti-Christs, showrunners Lauren Montgomery and Joaquim Dos Santos, their agenda, and the toxic work environment they manufactured around the VLD team. Now I knew to look for it, I could easily find utter hatred spewing onto the net for these two key figures. Apparently they were constantly butting heads with Hedrick and the other writers. Apparently they wanted Keith and his journey to be the focus, where the initial series set up differently, on all the characters but with Shiro, undeniably, leading the way. Apparently Shiro taking the lead incensed Montgomery and Dos Santos so much that they orchestrated Shiro’s death with the intention he never come back. The problems are much, much more complicated than this, but I’ll focus on the above for the sake of clarity in my rambling post, otherwise we’ll be here all day. No matter how I searched, I could find no official sources for this information (please enlighten me if you do!) – but this is widely accepted as Truth. Within the fandom, online petitions began calling for Dreamworks to fire Montgomery and Dos Santos. I’ll admit I was fascinated, watching from the outside. I loved VLD, but when I started really thinking about all the fandom proposed – I found I somewhat agreed with them. On a character development front, I wondered if we had been robbed of What Could Have Been. I didn’t mind it. I dunno. I felt a little deadened by the intensity of the fandom. Now that I knew to look for these strange character decisions and plot swings, I noticed them – they were very obvious. I started wondering why ABC had happened in season # if they were only going to do XYZ. On the whole, it was fine, I guess. I felt flattened; I felt little, to be honest. 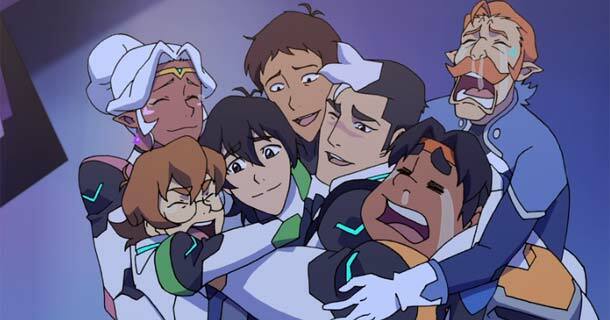 VLD no longer shone; I now wished for something more; arcs that had never eventuated and plots that had never been resolved; for there to be more meaning in countless interactions and more justice for the protagonists and growth for the antagonists. Cringing at what I’d find, but unable to stay away because I did want more, I hopped online. Predictably, the fandom HATED it with the fire and fury of a thousand suns. Rumours started flying that Montgomery and Dos Santos has been fired by Dreamworks (untrue). More petitions turned up, begging Dreamworks to allow Hedricks to write the show that HE envisaged. The Proper VLD. But of course; one that allowed the characters to continue to develop in the way they had been started, before Hedrick’s decisions were overwritten by the anti-Christs. It makes sense when you put it like that; why orchestrate a fabulous, complex story with nuanced characters, only to end it by flattening or not even acknowledging that setup? More rumours flew. 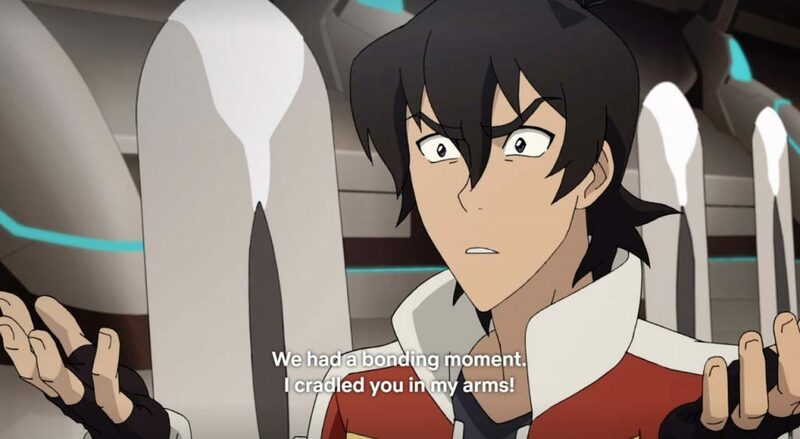 Hedrick had planned a Keith/Lance relationship; the LGBT+ representation that had been teased. 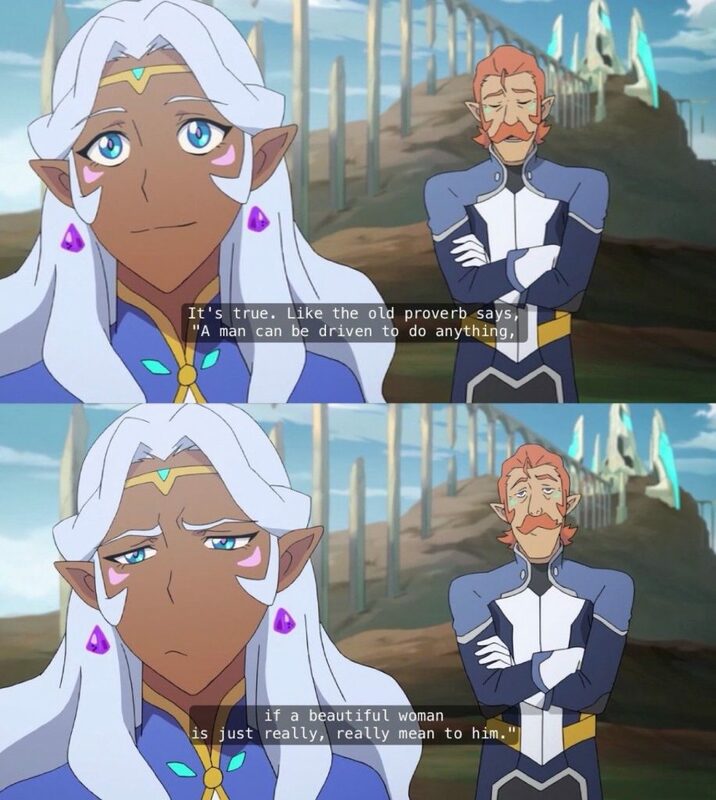 Hedrick had planned a Shiro/Allura endgame; that’s why they were basically space mum and dad to the Paladins. Hedrick had meant for every fan’s theories and dreams to happen. If only Hedrick had been able to remain on the show, it would have worked. If only Montgomery and Dos Santos hadn’t been horrible people and pushed him away, the fans could have watched the VLD they deserved. Some of the anger revolved around ships (“relationships”), but ultimately, the fandom was furious about the direction the characters and story had been taken. They were furious that the show they loved now made them sick. Some even refused to watch the final season for reasons of self-care, once they heard how it would end. Look I know I’m painting a pretty bleak picture of fandom here. I don’t agree with attacking anyone for any reason online, particularly content creators. But behind the backlash – this hatred for something that was once a source of such hope and fun? I could kinda see where they were coming from – even if I didn’t feel this pain as keenly as other fans did. Is it possible, if you immerse yourself in someone else’s creation, to be satisfied with its ending? I think not, and it’s both nobody’s and everybody’s fault. When I watched seasons 1-7 with no idea of the fandom in mourning, I was okay with it. Sure, there were things I’d have done differently, but I didn’t write the show. That wasn’t for me to decide. But somehow, if we immerse ourselves in a fictional world, we start to believe we are entitled to more than we are given. And if we are captured by a show – be it an arc or character/s that resonates – we don’t want their story to end. They are like family. The very thought of an ending – of no more content to look forward to – makes you feel physically ill. The ending comes, because all stories end. And you realise there won’t be answers to the burning questions you had. You realise that the character’s paths are now set; all those imaginings and theories speculated during the wait for new content are either irrelevant or impossible to imagine any more because of what came to pass. It’s over. And you’re sad. You reach out to others who are feeling what you feel. And together, you get mad. Questions that will never be answered; eventualities that you believed were certainties, that will never come to fruition. I believe there is a link between the level of immersion, and enjoyment of an ending one has on a piece of content. And when I got thinking about it – I could not think of a single show I have been immersed in, that I felt entirely satisfied with its finale. Why do we feel we have the right to be angry about someone else’s choices? Because we lived and breathed those choices, for a time. We knew the characters, we understood the background, and we picked up on the hints and clues littered throughout their adventures – with others who also lived and breathed it. It brought a sense of belonging, camaraderie, and hope. We loved that we were smart enough to have seen ABC in series X; were certain all the pieces of this fantastic puzzle would fall into place JUST SO because it was beautiful and poignant and perfect for a huge (documented and peer reviewed) list of reasons. And then you’re faced with the reality that not only it will never happen, but that you were wrong. Or that it didn’t matter. The deeper you are involved in a series, the less likely you are able to enjoy the ending. Because deep involvement somehow equals a sense of ownership. That by being so enmeshed in a world, you have a claim on it. And it hurts, bitterly, when you’re wrenched away from that. How the quiznak are content creators expected to remain true to their story if they’re facing impossible odds? That no matter what they do, it will disappoint those who were their most avid supporters? And how can we risk immersing ourselves in worlds knowing that the deeper we get, at some point, we will believe we know better than the creators – and that to watch the rest unfold will tear out our soul? Content we love immensely seems to be doomed to destroy us. So what. Should we stop caring about it so much? Impossible. Should content creators change their story based on what fans believe will happen? How is that fair? How can they make everyone happy where there are opposing views on what should happen? How does that help them to grow and be confident in their creations – to keep creating – when everything they present is second-guessed? Does anyone out there have any solutions? Can you think of a single series that you’ve been more than fleetingly involved with, that you’ve been entirely satisfied with? Because I’m still trying to figure this one out.